To provide a conduit to share his passion for aesthetic dentistry, Dr. Koczarski founded PAC-live, The Northwest Aesthetic Continuum and The Hornbrook Group. Dr. Koczarski has published numerous articles on the topics of aesthetic dentistry and is the editor for the Journal of Cosmetic Dentistry and is on the editorial board for PPAD journal. Dr. Koczarski will discuss how an intra oral mock-up can provide valuable information to the patient, the lab and the dentist. 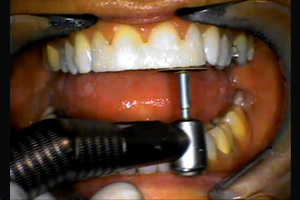 He will demonstrate a freehand composite mock-up technique on the front four incisors. The process of a mock-up is not only designed to show what can be achieved but also what cannot be achieved. Dr. Koczarski will follow the AACD accreditation standards for the Case 5, 6 or more direct resins veneers but will only be demonstrating the technique on the front four incisors. Describe treatment options for a patient with short front incisors, old silver amalgams and limited fullness of the buccal corridor. Discuss smile design utilizing the length, horizon and midline of the smile combining the eyes, commissure and the lower part of the face. Compare and contrast a wax-up and a mock-up. Describe the necessary steps to complete an intra oral mock-up. Simon, Harel and Magne, Pascal. Clinically Based Diagnostic Wax-up for Optimal Estetics: The Diagnostic Mock-up. CDA Journal., Vol 36(5), 2008. In part two of Dr. Michael Koczarski\'s program on taking a mock-up to completion.